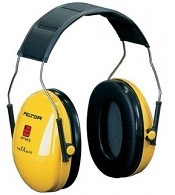 If you need ear protection in your workplace, you will need to decide which is better – ear muffs or ear plugs. Each has advantages and disadvantages, and to get the right hearing protection it’s important to understand what each type of protection offers. This guide will tell you everything you need to know about the differences between ear plugs and ear muffs. One of the main advantages of ear muffs is that they are easy to fit. They do not need to be specifically prepared, and can simply be put over the head. This makes them ideal for intermittent use, and especially suitable for work in construction and landscaping work. Because they are easy to fit, ear muffs provide a consistent and reliable fit. This means that you can be sure that the protection wearers are getting meets the listed protection for the ear muff. This is important where workers may not be able to always properly fit ear plugs. In cooler climates, ear muffs are often more comfortable for workers for wear hearing protection for long periods of time. However in warmer climates, you may find that ear plugs are more comfortable, as ear muffs can be warm and humid. Ear Muffs are very easy to fit, but they normally offer less protection than ear plugs. This is because they only sit over the ears, rather than directly in the ear canal. The way that ear muffs cover the ears can also be a problem in hot environments, as heat can build up, causing discomfort for the wearer. Another issue for ear muffs is that they can lose some of their protection when worn with other types of PPE, particularly safety glasses. The main advantage of ear plugs is the level of protection they provide. Because they fit directly into the ear canal, ear plugs offer greater protection than ear muffs. This means that ear plugs are suitable when you need the highest levels of protection, for instance in very loud workplaces such as factories, airports, and foundries. Ear plugs are also very light and easy to carry. Because they are small, they can be carried in specially designed cases which easily fit into a pocket. Ear muffs, however, are more difficult to carry and protect, making them more cumbersome for workers. If you need to wear other types of PPE, then ear plugs are probably the best choice. Because ear plugs fit comfortably into the ear canal, it is easy to wear them with other types of PPE. This makes ear plugs a great choice for anyone who has to wear helmets and safety glasses. One problem with ear plugs is that they can be difficult to fit. They rely on properly fitting the ear canal to ensure full protection, and this can be difficult to guarantee. However, if employees are trained on how to correctly fit ear plugs, then ear plugs are able to consistently provide their listed protection. Take a look at our expert Buying Guides, How to Guides, Training Tools and Checklists for everything you need to make purchasing simple and help your business stay compliant. Knowledge that will save you time and money.